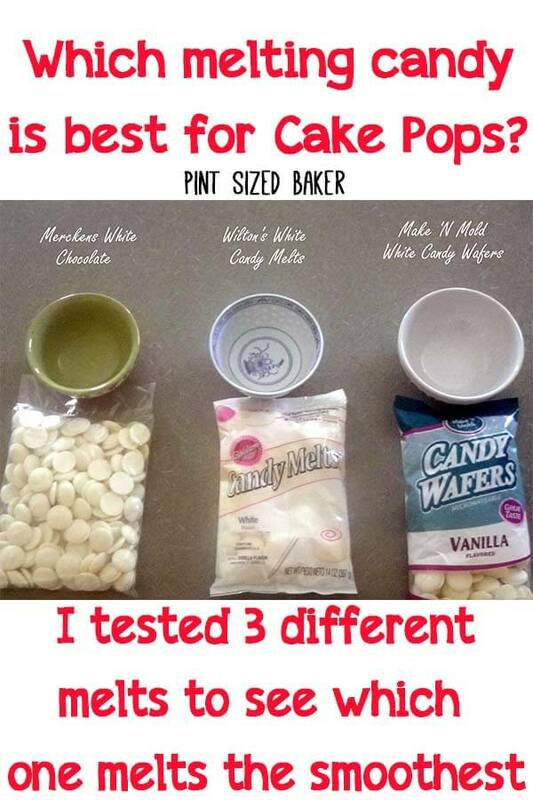 Confused about which candy melt to use for your cake pops? I did a Melting Candy Wafers Test to see which brand would melt the smoothest. 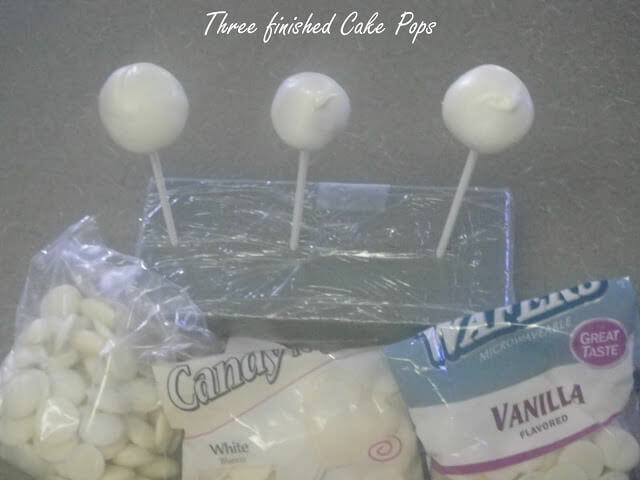 So… a while back I was going to do this big test of 5 different candy melts and a bunch of cake pops and see if it was the candy itself that led to cracking pops. It was an ambitious goal that I failed at… It was just too much to do. Too many supplies, too many pops, too many variables. Sorry. 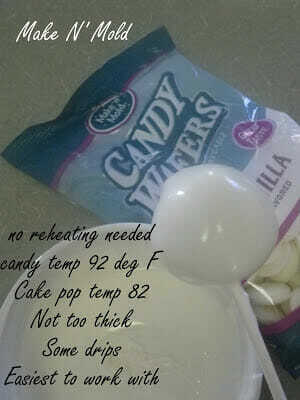 What I did instead is melted 3 popular candy melts and judged the melting consistency and temperatures. This is not rocket science, but there were some parameters. 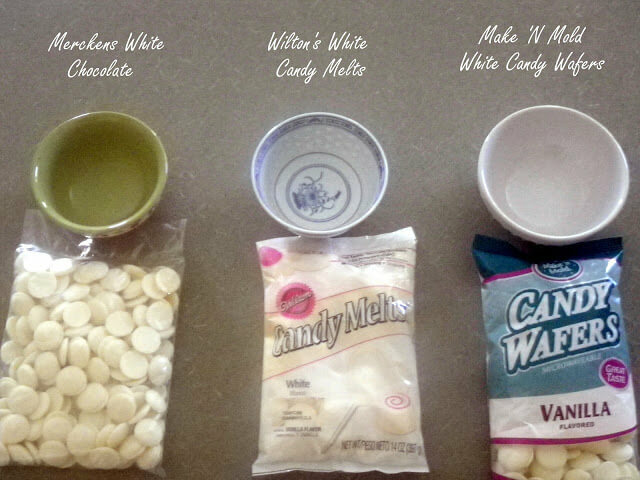 I tested Merckens White Chocolate, Wilton’s White Candy Melts, and Make N’ Mold Melting Wafers. 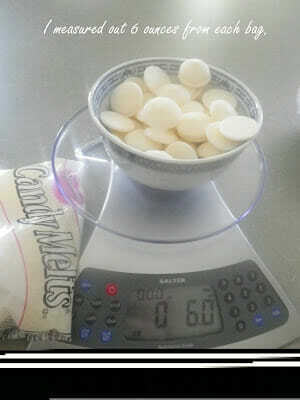 Using my scale, I weighed 6 ounces of each candy. 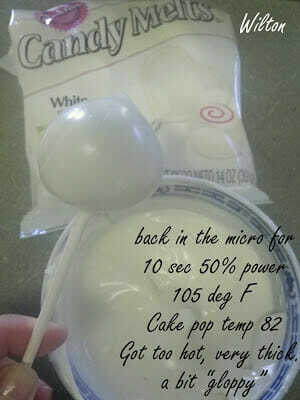 Using a 1000 watt microwave, I started off with 45 seconds at 70% power for each bowl of candy. The Merckens and Make N’ Mold only needed one time in the microwave. The Wilton’s needed a bit more to fully melt. I should have taken my own advice and been a bit more patient, because I did get the Wilton’s too hot. Pros: Smallest wafers which may have led to quicker melting and a smoother consistency. Melted smooth without being too runny. I prefer a thicker coating. 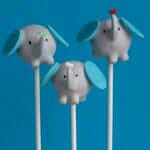 The coating stays put and does not drip down stick or make funny “tails” on the pops. Overall the best tasting coating of the three. Cons: Not sold in craft stores. 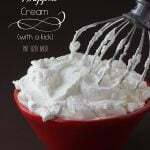 Must order online or find local baking supply store. Pros: Cheapest and most easily found in craft stores (or even Wal-Mart). Cons: Thickest coating. Too thick in my opinion. 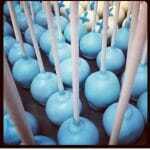 The thicker the coating the more likelihood of it pulling the cake pop off the stick. Largest wafer size takes longer to melt. Pros: Of these three, I thought this had the best dipping consistency and was the easiest to work with. 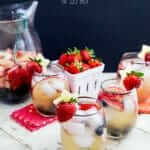 Price: $3.30 for 14 oz. bag online. Discount in bulk purchasing. All in all, the pops looked the same. I could see no difference in the final product. I think it comes down to your preference and your budget. For me, Wilton’s is fine when it’s on sale 🙂 and I am lucky to have Merckens and Make N’ Mold within an hour drive of my house. 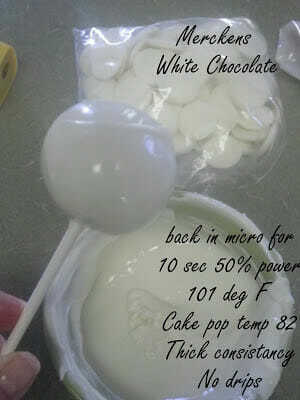 You can see a over 500 different Cake Pop Tutorials here! 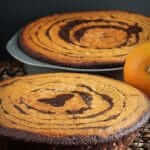 I have used Almond Bark and I do like it. If you are going to use the Bark, melt it in the tray it comes in and then transfer it to a bowl to dip the pops into. Make sure that the bowl is deep enough to cover the pop dipping straight down. I was asked on FB to "test" the different candy melts and I wanted to include the Almond Bark and Baker's Chocolate, but I just didn't have it all together when I started it. Very useful test. 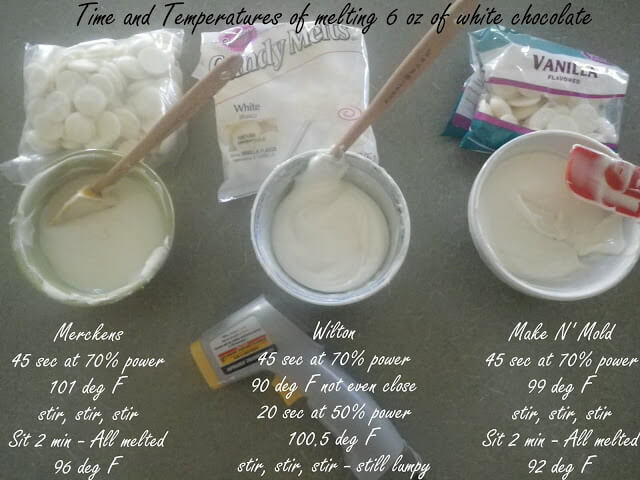 It's good to know which white chocolate is good for melting. In my opinion, Merckens is the best choice. Merckens is always the best – but NEVER melt chocolate in glass or ceramic bowls!! The glass or ceramic will cause the chocolate to continue cooking and will overheat, get lumpy, and tiny little chunks (aka burned!) You can use good ol' glad containers or the reuseable containers that you get lunchmeat in, and when you are done just put the lid on. ready to remelt for the next time. You can find merckens in a lot of different flavors, colors, and quantity sizes at Baker's Nook in Saline MI. They are really the best price around. I live about an hour away and still prefer to have it shipped because the traffic is terrible for me to get there. They have a huge online shop too, Good luck! Lorna’s Cake and Candy Supply in Allen Park, MI also sells Merckens. They have been around for many, many years and have great prices. I’m pretty sure their Merckens chocolate runs around $3.40 per pound. They also ship, but no online ordering. You have to call with your order and they just charge postage, no handling fee. Especially at holiday time, I have them ship to me all of the time. They are great! I have been using Merckens for more than 35 years. I will on occasion us the microwave for small amounts but I still prefer to melt on the stove. On the stove is great. So is in their new heater. But most people use the microwave to melt it. Thanks for this informative side-by-side comparison. I will probably never use the Merckens because I cannot find it anywhere and I usually won’t order online when the other two are readily available, the Wilton’s at the grocery store, and the Make-n-Mold at the craft store. I would just assume by looking at the packages that the Make-n-Mold is the least tasty, because I recently bought some Milk Chocolate, and it is covered in the white powder, and the ingredients just seem a bit more shady to me, with the artificial flavoring in it and what not. Generally the “white powder” is referred to as bloom. The milk fats have separated from the chocolate. It’s not a bad thing, it just wasn’t kept at an ideal temperature. From what I can tell, none of these brands have actual chocolate in them. They all have the same basic ingredients of Sugar, Partly hydrogenated palm kernal oil, and flavoring. I’d say buy what works best for you and tastes best to you. Now, I’d like to get your take on the Baker’s brand meltables, because they DO have chocolate in them. They have almost all of the same ingredients in them that a baking bar does but they coat truffles and ect. most perfectly. I don’t think Baker’s has white chocolate but they do have milk chocolate. Real chocolate needs to be tempered if you are looking for it to get hard and “crack” when you bite into it. Tempering chocolate can be tricky because you want to warm it to melt, but not get too hot and then cool it slowly, but not let it thicken. 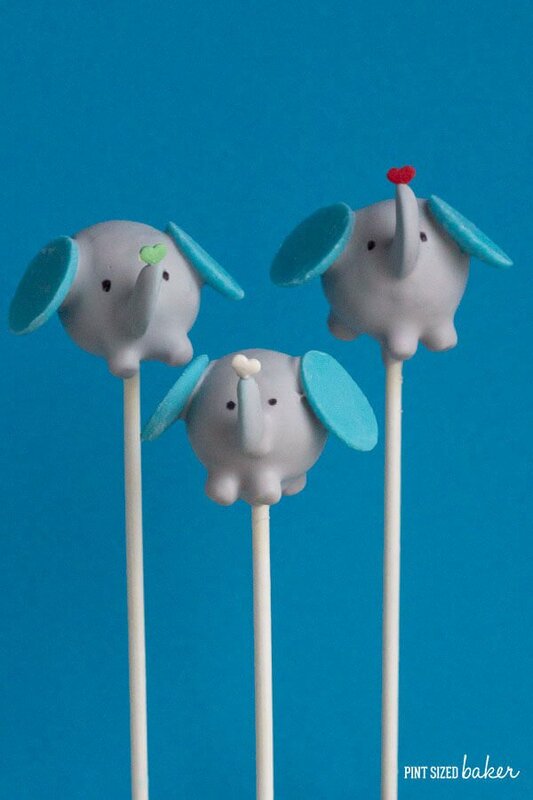 With candy melts, they always dry with a hard shell on your cake pops. 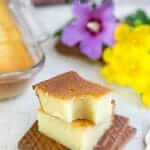 No refrigeration required with melts. Don’t put chocolate into the fridge uncovered. Water will condense on the chocolate when you bring it out and will cause the finish on it sweat it will look horrible. 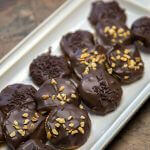 In the end, I think it all depends on what you are doing with the chocolate and who you are making the treats for. Thanks for the testing. Was there any difference in flavor among the three? Thanks! Nope. None that I could tell. There really isn’t anything different in the ingredients, so it comes down to the amounts of the ingredients that makes the difference. Need help. Been dipping eggs for 30 years. 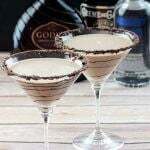 Having trouble with Merckens White Chocolate getting lumpy. Am I overheating it. It’s hard to know what could have happened. The candy coating may have been old, you could have gotten water into it, or overheating it could cause it to burn. Low temps and a slow melt work best. Thanks. Candy melts aren’t real chocolate and some can taste a bit off. I also like CandiQuik but it wasn’t as popular when I was did this test. And a lot of times I’ll buy the white candy from Wal-Mart, I think it’s called Log House?? It’s not a wafer, but a big pound of bark candy. I purchased the Wilton chocolate melts and they already had bloom on them. Can they be tempered if they are not real chocolate? I don’t have another bag without bloom so I have nothing to correctly seed them with. Are these just trash? 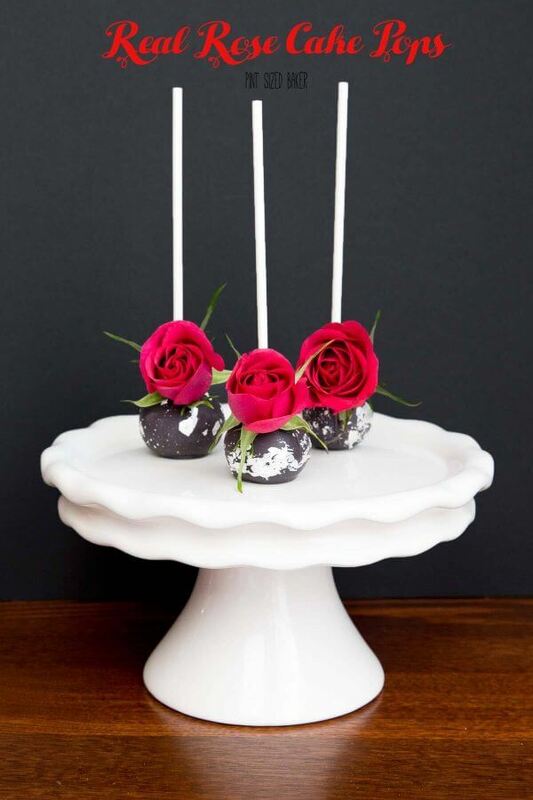 Since there is ZERO chocolate in Wilton Candy Melts, the bloom isn’t a factor. Depending on much the candy has bloomed can make a difference in streaks left behind when the candy dries. I’d mix the two bags and go forward. It’s not totally lost.